In the course of one day, we experience so many emotions. Some, such as genuine love and compassion, are valuable. Others, such as attachment, anger, closed-mindedness, pride and jealousy, disturb our mental peace and lead us to act in ways that hurt ourselves and others. This workshop will help us to examine our disturbing attitudes and negative emotions and to explore some antidotes to pacify and transform them. Ven. Thubten Chodron will introduce some helpful techniques. Participants will be able to put them into practice and derive real benefit from them. Sprache: Englisch. Keine Übersetzung ins Deutsche. Language: English. No translation into German. Born in 1950, Ven. Thubten Chodron grew up near Los Angeles. She studied and practiced Buddhism of the Tibetan tradition for many years in India and Nepal under the guidance of His Holiness the Dalai Lama, Zopa Rinoche and other Tibetan masters. She was head organizer of the study program of the Lama Tsong Khapa Institute in Italy and taught at the Amitabha Buddhist Center in Singapore. Ven. 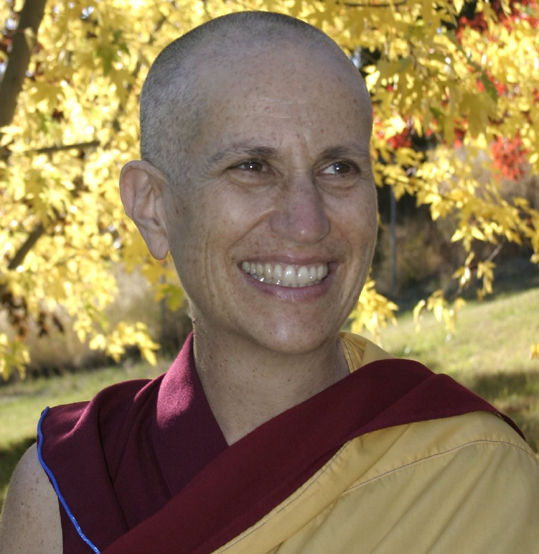 Thubten Chodron travels worldwide to teach the Dharma. She founded Sravasti Abbey, a Buddhist monastic community in Washington State, USA and is currently the abbess there.